It can be a fraught time involving unwanted complicated work, when things go wrong and need to be re-done. Who wants to stop and re-trace their footsteps? 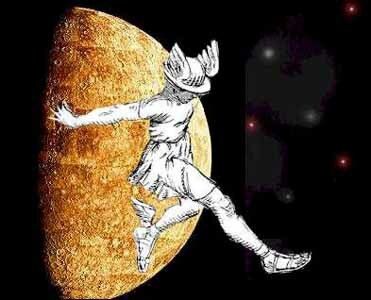 But sometimes this is just what we need to do; and Mercury is there to make sure we do it. Re-evaluation can be a valuable process, revealing all sorts of interesting things. Mercury’s retrograde is also about communication. With others, our environment, and also ourselves. I guess in a retrograde it’s tempting to resurrect old arguments and demons. Since we’ll probably be more sensitive; we’ll be more likely to misread another’s communications (especially electronic) and make mistakes. It’s actually a good time to shine a light on those little demons, questioning and re-thinking our feelings. We certainly need to be forgiving of those misdemeanours and mishaps we’re all prone to, but especially during the next couple of months. You know that critical inner voice we were looking at on here before? Pay less attention to its harsh judgements for awhile, as it’s likely to hurt more than usual. Remember instead life’s dream-like quality, sit quietly, meditate. All in all, it’s a time to be kind to ourselves and others. Give ourselves some extra time and space, and swim with that planetary magic.